Great weather for spring break this week! 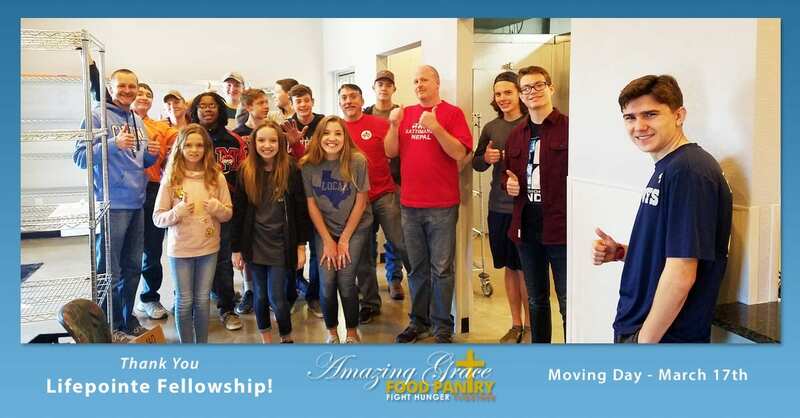 Lots of students spent their week volunteering at Amazing Grace Food Pantry, serving families and helping in the move to new facility. We’re all looking forward to serving clients in larger space next week. Goodbye Old Building – You’ve served the community well the past 12 years! Thanks right, folks. We’ve moved! Well, next door into the new building. It has been a LONG road, but we’re finally going to put this new space to the test with clients, deliveries, scores of volunteers and the typical goings-on of the typical pantry week. There is still much to do before this project is finished, but the interior is finished, shelves are assembled and we’re more than ready to show what all your support has brought to life. Grand Opening ceremony is set for April 6th at 11:00am. We’re looking forward to seeing anyone who wants to share in this celebration, along with Wylie’s Mayor Eric Hogue, Teresa Jackson from Sharing Life in Mesquite, Trisha Cunningham from the North Texas Food Bank, Pastor Craig Rush from Chase Oaks Church and Congressman Pete Sessions.